Where a casement window requires a restrictor, Caldwell can provide specifiers and fabricators with the 900 Series of face mounted restrictors. The 900 series is especially useful in systems in which require ease of fitting, or configurations where in-channel bar style restrictors are not suitable for installation. The 900 series from Caldwell is a face mounted restrictor which incorporates a spring action arm, is aluminium extruded, and features positive re-engagement to ensure that the restrictor automatically re-engages when returned to its original position. For improved strength and guaranteed levels of consistency and finishes, Caldwell’s 900 Series of restrictors are extruded in aluminium to BS1474, as are any arm housings or locking arms. Screws, rivets and springs are manufactured in steel. 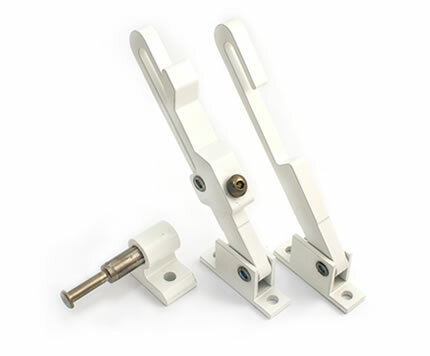 901 restrictor arm: Like the standard 900 restrictor arm, the 901 is also self-engaging and spring operated to ensure that the restrictor automatically re-engages when returned to its original position, but it also features a locking arm which can be operated by Allen key for the more security and safety conscious. 901S restrictor arm: The 901S restrictor arm is similar to the 901 model, but can offer even further enhanced levels of security. It is lockable like the 901 arm, but instead of using a regular allen key, it requires a particular security screw with corresponding allen key, the N70001 (which can be separately supplied by Caldwell).